Thousands of people staged a massive protest in the United Kingdom when they surrounded a nuclear weapons factory with a “peace scarf” to advocate for nuclear disarmament. Earlier this month, thousands of people staged a massive protest in the United Kingdom in which they surrounded a nuclear weapons factory complex in Berkshire with a “peace scarf” to advocate for nuclear disarmament. 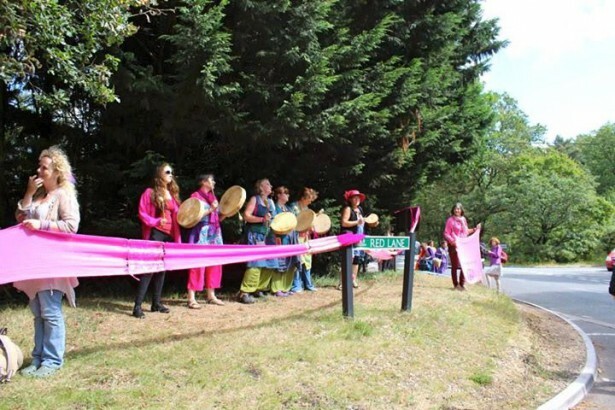 The action drew such immense turnout that it took five hours to assemble the wool peace scarf, which ultimately stretched for more than seven miles. The thousands of people who took part in making and putting together the scarf were from across the U.K. and beyond. This protest was a response to the government’s plan to renew the Trident nuclear weapons program in 2016. The action was coordinated by three U.K.-based groups: Wool Against Weapons, Action Atomic Weapon Eradication, and Campaign for Nuclear Disarmament. Jaine Rose, the founder of Wool Against Weapons, connected the renewal of the Trident nuclear program to the violence in Gaza that has sparked massive protests over the last month. “We are seeing at the moment people are horrified at the escalating violence in Gaza. This is a time for people to have a voice to say no to violence and for countries to find other ways to create peace,” she stated.